I am re-reading Michael Singer’s great work — “The Untethered Soul: The Journey Beyond Yourself”. It was not a planned excursion. The book bubbled back into my hands because our return plane was delayed five hours. That gives a person good reason to get restless and so I was; finding myself scrolling through the book rack on my Kindle, marveling at the epic journeys I have taken in the last year or so via the written word. My first read of “The Untethered Soul” was from before our own epic trek from California to Florida, before we even knew of its possibility. I have other books in process, or asking to be, but this one waved like an old friend (also, it has a horse on the cover) and I thought, hey, I’ll just skim it, read the highlighted passages — of which there are many — and even more turned to yellow as I passed again through the pages. As often happens, the serendipity of this nudged second reading smacked me sideways in pretty short order — right around Chapter Fourteen. Our return plane trip was from New York. 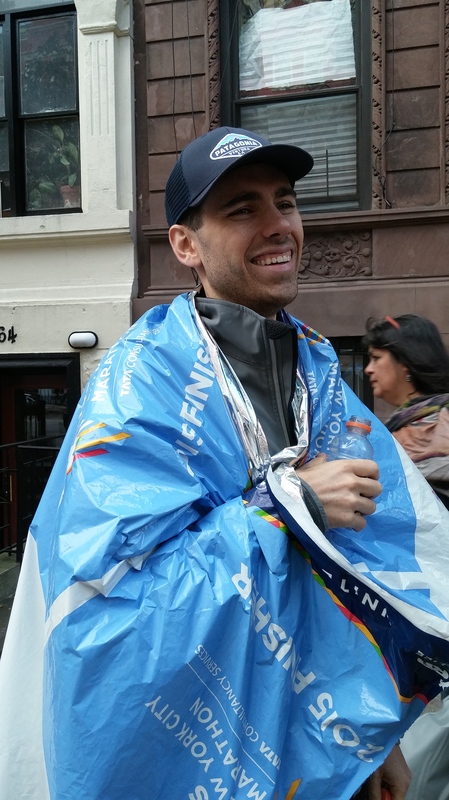 We had flown there for the weekend to experience the running of the New York City Marathon, and, more specifically, to be an on-site fan base for our nephew, Lyman, in the running of his first marathon. Now, the New York City Marathon is a heck of a big deal — 50,000 runners (and disabled bikers) and the city goes all out in staging it. Late Saturday afternoon, we walked with Lyman to Central Park and through the finish line area. The banners, the grandstands, the big screens, the media equipment, the security, and blockades — It gave us all a case of the butterflies. There are a number of ways to get into the New York Marathon: Invitation (if you’re very good), lottery (if you’re very lucky), and qualifying (if you’re very determined). Lyman is the determined kind. He trained and ran qualifying finishes in almost a dozen races to get that slot, his slot, #2267, and now it was show time. 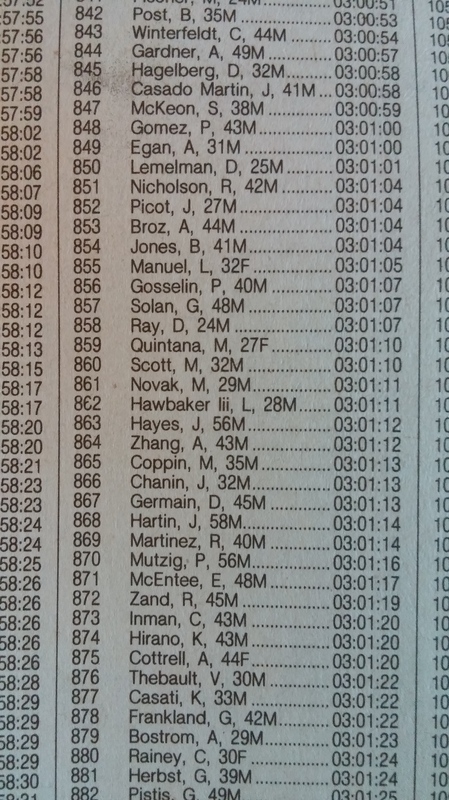 His goal was to run a 3 hour race, yup, 26.2 miles in 3 hours. His pace is good enough for that; the question would be, is his endurance? He had his running strategy worked out and, over dinner, we planned our viewing strategy, choosing locations at miles 17.5 and 24.5 to cheer him on. There is an outside view and an inside view to this. Here is the outside view. 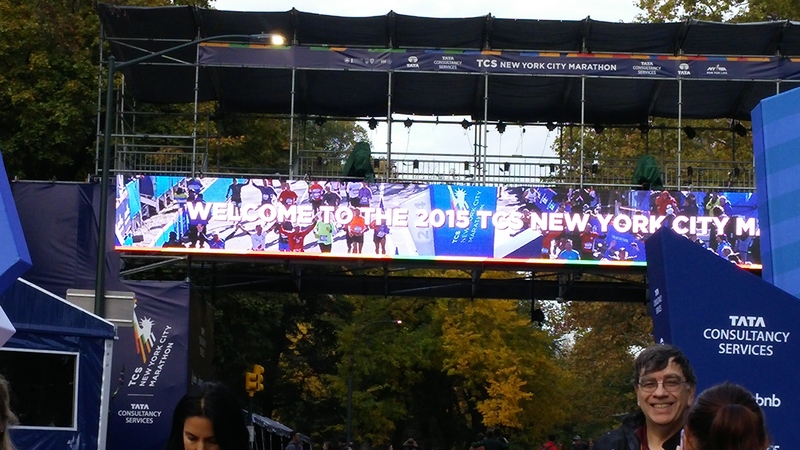 Participating in the watching of the New York City Marathon is a festive, going-to-the-fair kind of experience. At mile 17.5 everyone is excited, energy is bouncy. Some hold signs and banners, craning their necks to catch the first glimpse of their father or sister or college buddy or roomie coming up the street; others are there for the event itself, cheering on everyone in general. There’s an app that lets you track individual runners, so we knew how well Lyman was doing holding his pace, and — most importantly — when to be full-on, eye contact, jump up and down, name yelling, cheering him on. It worked and everyone in the crowd around us joined in. He pumped his hands in the air as he streamed by, running loosely in a small group of similarly paced runners, looking so good. As the runners made a long loop up and down Manhatten, we cut across to mile 24.5, snugging up to the barriers right before the course turns into Central Park and to the finish line. The professional men and women have already come in, but we are still ahead of the first 1000 finishers. The energy is completely different here. It is a long, uphill haul to the Park entrance. Some runners still hold pace, many don’t. Faces and bodies contort with pain. Some walk, hands on hips, willing themselves to get going again. The crowd is hugely sympathetic — you can do it, don’t give up now, almost there! The runners are in a world of their own. Lyman has slipped a bit on his pace, but just a bit. We see him coming. He is running the same race — the same pain shows. We, too, yell you can do it, almost there! As if he doesn’t know where he is. He crossed the finish line just over 10 minutes later with a finish time of 3:01:11, the 862nd finisher of the 2015 NYC Marathon. More than 49,000 runners would come in behind him. Here is the inside view of this, working backwards. After Lyman crossed the finish line, after he received his medal and retrieved his bag, he walked down the cordoned-off pathway designated to take runners out of the Park. It’s a long walk and he couldn’t do it, or more specifically, his legs couldn’t do it, could not carry him anymore. He stopped at a bench and called us and we managed to short-cut him out with the help of supportive onlookers. At mile 24.5, all that Lyman could think about was the pain and the raging desire to not be moving, to not be running. His mind/body connection was so disoriented that he thought he had quit running and was, in fact, crawling, legs moving with no forward momentum. Coming up to mile 17.5, the thought of stopping had occurred to Lyman a thousand times. He negotiated with himself — you can quit after you see them, out of sight of the cheers of the people who know you. You already know the outside story — he didn’t quit. He hadn’t slowed to a crawl; his pace barely altered between his first and last splits. He did something both phenomenal and brutal, for a medal that would have been given to him just for finishing. He, however, wanted to get it for being more than a finisher. He wanted to be one of the better ones. He wanted to push his own boundaries. When you constantly go beyond yourself, there are no more limitations. There are no more boundaries. Limitations and boundaries only exist at the places where you stop going beyond. If you never stop, then you go beyond boundaries, beyond limitations, beyond the sense of restricted self. “Limitations and boundaries only exist at the places where you stop going beyond”. Like mile 24.5. Or 17.5. Or never challenging yourself to run a marathon at all. To go beyond you must keep going past the limits that you put on things. It’s such an exquisitely simple and beautiful concept. There is a “beyond” because there is a limit and you will never experience what lies beyond if you never go past the limit. So there are two ways you can live: you can devote your life to staying in your comfort zone, or you can work on your freedom. It’s not doing what you think you can do that matters, it’s facing what you think you can’t do and then finding it in you to do it anyway. So you see, a cage doesn’t have to look like a cage. It can be a cage created by your fear of discomfort. If you approach your limits, you begin to feel uncomfortable and insecure. Those are the bars of the cage. As long as you stay inside of it, you cannot possibly know what is on the other side. Lyman is my nephew and I would like to think I have been able to share a thing or two with him during his lifetime that he found useful, that were meaningful to him. Age does that — makes you think you’ve got something to offer. But here’s the real deal. That child who became a man on my watch, showed me something deeply meaningful about life itself by the race he ran this Sunday; the race he ran in his own head and body and spirit. Pretty sure he would not be comfortable with my words on this and pretty sure it is the right thing to put these words out in the Universe. He is my hero. Thank you so much for your kind words and your equally amazing finish — I am in awe and humbled!